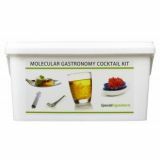 The Modern Mixologist Cocktail Kit will introduce you to various modern ingredients and techniques which will help you make delicious drinks and cocktails. Containing 9 different ingredients, equipment and recipes which range from easy to challenging, developed by award winning modernist chef Eddie Shepherd. 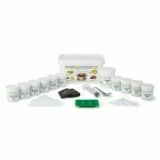 It will teach you various techniques it and help you understand how these techniques and ingredients work. Learn spherification & reverse spherification techniques. Create caviar pearls / fruit bubbles which pop in the mouth. Learn how to deconstruct your favourite cocktails. Turn liquids into stable foams. Create a sparkling rim on your cocktail. Create a dramatic visual effect. Use ice cubes to change the flavour and colour of the cocktail. Stay ahead of the curve in the art of mixology. French 77, Espresso Martini, Mojito with sparkling rim, Watermelon Mojito with Watermelon Pearls, Deep Blue Daiquiri, Absinthe Candyfloss, Ultramarine Aviation, Indigo Chi Chi, Blue Rose Gin and Tonic, White Russian Sphere, Bloody Mary Sphere, Raspberry and Rose Fizz, Blueberry Moscow Mule, Cucumber Gimlet with Cucumber Pearls, Chocolate Orange Martini, Basic Simple Syrup, Suspension Syrup, Pure Blue Syrup, Sodium Alginate Bath, Calcium Lactate Bath. Lime Essential Oil (30ml), English Rose Flavour Drop (30ml), Lecithin Powder (from Soya (50g), Sodium Alginate (50g), Calcium Lactate (50g), Xanthan Gum (50g), Zorbit (Derived from Tapioca.) (50g), Pure Blue (Butterfly pea flower extract, water, sugar) (30ml), Crackle Crystals (Sugar, Glucose, Cocoa Butter, Carbon Dioxide, Natural Flavourings) 100g. Pure Blue only: After opening: store in fridge for up to 3 months. Unopened shelf life of 1 year.